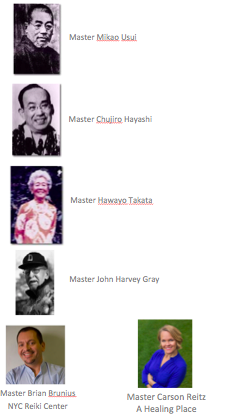 Our lineage goes back to Master Mikao Usui Sensei. We honor his intuitive sense and his gift from Source. We honor the protocol that was given through his subsequent Master students. We honor the Universal Energy Field and the healing power of the human body. Our system is more involved than some of the systems you may have come across. Because of that you will leave Master Practitioner training ready and supported to begin your own practice. In Level I Reiki students learn the history of this system, how to heal yourself, how to use pendulums and tapping into your internal guidance system. They will learn about self care, nutrition, the chakra system, the physical body and honoring their vessels as a sacred container for the Universal Energy Field. At this level students are Attuned to the Reiki Healing Energy. In Level II Reiki the Reiki symbols are given and memorized. Students learn aura scanning, protections, and doing Reiki over long distances. In this level students will also learn how to administer Reiki to another individual with guidance in hand positioning and tapping into their intuitive receptors. They will learn how to open and close a session and after being attuned to level two they are highly encouraged to being practicing regularly on others for an energetic trade before the move on to the next Master Level. At this level students are attuned to Level II Reiki Healing Energy. This level is begun after roughly 3-6 months (depending on the commitment of the student) of practice and at least 10 sessions on others is accomplished. The timing is at the discretion of the teacher and is individual. Level Three attunements are received. Master Level Three Symbols learned. You will also learn shamanic extraction, psychic surgery, cutting cords, using crystals in sessions and activating crystal grids. More advanced methods are also learned like clearing and preparing a space and Reiki Rituals. After level III students are allowed to work on others for an exchange of money. To complete Mastership - the student must have their teacher sign off on 3 Reiki Sessions to be witnessed by their Teacher. Master Attunements are received. Master Teacher Symbol is given and taught. Student learns how to teach/hold Reiki classes, learns how to attune others and hold space. The student must complete 4 co-teaching classes as well as a final individual session with their master before the Level 4 Master Teacher is complete. Depending on Student & Master this can be over several months or in a shorter period of time and is at the discretion of the Teacher. Student must complete written test to receive their Master Teacher Level Certificate. Our Master Teacher Marnie Quinn began her Reiki journey in NYC in 2015 where she was attuned to Reiki by Master Brian Brunius of the NYC Reiki Center in Union Square in Manhattan. She received her final Reiki attunement and her title as Master Reiki Teacher in 2017 by Carson Reitz in Westminster, Colorado. Marnie combines two lineages through her two Masters and two methodologies - a strict method direct from Hayashi and a very intuitive method that was given to her through Carson Reitz. Learning Reiki through Ceremony means you receive a vast knowledge of information and a short lineage to the beginning of Reiki with only 5 other people in line to Usui Sensei. We are honored to keep the purity of this practice in our teachings as well as activating and opening up practitioners to their intuitions and their own unique gifts. ALL REIKI LEVELS MUST BE COMPLETED BY THE SAME TEACHER. IT IS REIKI PROTOCOL TO NOT TAKE ON STUDENTS FROM OTHER TEACHERS. IF YOU HAVE GONE THROUGH LEVEL 2 YOU MUST RETAKE A PRIVATE LEVEL 1&2 AT CEREMONY TO ENSURE YOUR TEACHINGS AND TO HONOR THE LINEAGE AND INFORMATION LEARNED. YOU WILL NOT BE ABLE TO COMPLETE MASTERSHIP THROUGH CEREMONY WITHOUT GOING THROUGH THE ENTIRE SYSTEM. THIS IS TO ENSURE ALL MASTERS LEAVING THIS LINEAGE ARE PREPARED AND READY TO HOLD HEALING SPACE FOR OTHERS. NO EXCEPTIONS. WE ARE STRICT FOR THE SAFETY OF THE CLIENTS WE WORK WITH. WE TAKE OUR JOBS AS VESSELS OF THIS LINEAGE VERY SERIOUSLY. IF YOU WOULD LIKE TO OBTAIN MASTERSHIP THROUGH CEREMONY CENTER FOR HEALING AND HAVE BEGUN YOUR REIKI JOURNEY ELSEWHERE, WE OFFER A PRIVATE CONDENSED REIKI I & II CLASS IN ONE DAY THAT IS 5 HOURS FOR $395. THIS IS TO ENSURE THE KNOWLEDGE YOU RECEIVE IS INLINE AND THAT YOU ARE FULLY EQUIPPED TO PERFORM REIKI FOR OTHERS IN A SAFE AND SACRED WAY.